This Tax Service Feather Flag is Ready to Ship. This Display is In Stock! This Tax Service Feather Flag is Affordable! Pre-shaped aluminum pole is low cost and portable due to 4-piece design. Single side dyed through (mirror image on backside) for a highly visible banner. 14' Height with vivid yellow, blue, and red color scheme for an eye catching display. Metal ground spike for a reusable installation. Quick, one person assembly - Watch Video! This tax service feather flag that comes with a ground spike is for outdoor installation. These message swoopers are portable making it simple for purchasers to take in this display at night to extend the lifespan. This tax service feather flag that is bright is printed on a poly knit material. This signage is the ideal low cost business marketing product. 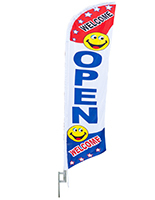 This portable tax service feather flag includes a 4 piece aluminum pole that goes together in minutes. Accounting businesses will greatly benefit from this display by grabbing the attention of passerby customers. This tax service feather flag is economical for small establishments seeking more exposure. These swoopers are easy to use and transport. This tax service feather flag is ideal when strategically placed by the road for passerby customers to see whether on foot or in a car. This display is sure to give any businesses more attention and ideally increase sales! 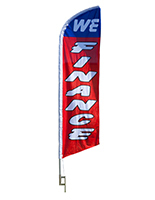 This outdoor tax service feather flag, also known as a swooper, is portable and sets up in minutes. This signage utilizes a four piece aluminum pole. Comparable swoopers use a fiberglass pole which is more expensive. 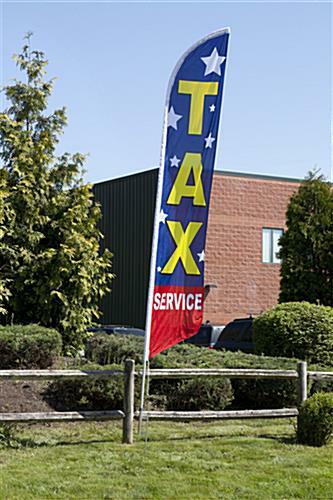 This tax service feather flag is a fraction of the cost due to the use of the aluminum pole versus fiberglass. Aluminum poles are light weight making them easier to carry than fiberglass. This message banner, tax service feather flag that is 14 feet tall is perfect for creating a presence. This signage is affordable and sold at a wholesale price! This tax service feather flag helps set businesses apart in a competitive market. Please Note: This 14' economy display banner does NOT include a carrying case. Please Note: String at bottom of banner is not for attachment purposes and may tear the fabric if used to attach the flag to the pole. 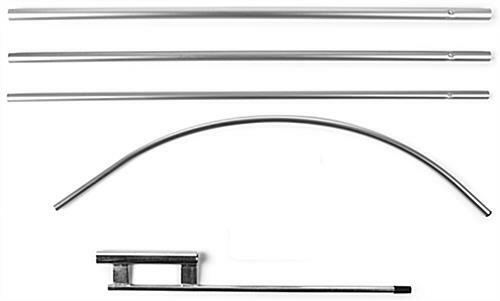 Each sectional pole comes in 3 or 4 sections (there is no difference in functionality) and features a curved top section designed to keep the banner in place during use. Flags are not for use in winds exceeding 40 mph. 27.0" x 165.0" x 1.1"